KABUL, Afghanistan — Afghanistan was reeling on Tuesday from a brazen Taliban assault on a military base that killed at least 45 people and wounded as many as 70, according to provincial officials. There were fears, however, that the death toll from Monday's daytime assault on the base, which also serves as a training center for a pro-government militia and is run by the country's intelligence service, was even higher. 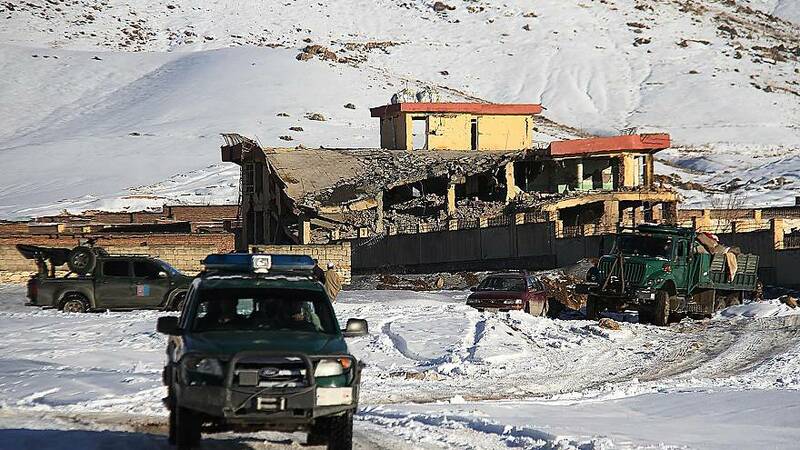 The attack began when a suicide bomber drove a Humvee into the base in eastern Maidan Wardak province and detonated his load as he rammed the vehicle into the main building there, according to local official Khawanin Sultani. The Taliban promptly claimed responsibility for the attack. In a separate statement, the group later said it had met again on Monday with U.S. representatives to discuss "ending the invasion of Afghanistan" in talks that were due to continue on Tuesday in Qatar. The Taliban holds sway in almost half of Afghanistan and carries out attacks on a daily basis, mainly targeting the country's beleaguered security forces. The base that was hit is located on the outskirts of Maidan Shar, the provincial capital, about 25 miles from Kabul. There were no official statements from the government in Kabul and it was not known how many of the dead were members of the militia in training and how many were military and intelligence officers and instructors.